The long e, short i, and short e /i, ɪ, ɛ/, are three front vowel sounds that can be practiced from a high, front tongue position to a mid-front position. Compare and contrast! Hi again, and welcome back to the American English Pronunciation podcast. My name is Amanda, and this is our 217th episode. Listen to the end of this show to hear how our sponsor, Audible.com can help you learn better English pronunciation. Our last episode was about the cardinal vowels—those vowels in the corners of the vowels diagram. The cardinal vowels in English are the long e /i/, oo sound /u/, short o /ɑ/, and short a /æ/—(long e, oo sound, short o, short a). The oo sound (oo sound) and short o (short o) are in the right side of the diagram because we create them using the back of our tongue. The long e (long e) and short a (short a) are both forward vowel sounds and they are shown on the left hand side of the diagram. We create these sounds using the front of the tongue. Today I’m going to compare the long e to the two front vowels below it on the diagram, the short i /ɪ/ and the short e /ɛ/. Before I get into the descriptions of how to say the vowels, I want to remind everyone, or mention it for the first time if you’re a new listener to this podcast, that the terms “long vowel” and “short vowel” aren’t actually describing the length of time that we say the vowel sounds. These are just the names that people in the Untied States tend to use for these sounds. I use these names here because I know that if you want to learn more about these sounds, you can search online using these names and find more information about these same sounds. The International Phonetic Alphabet symbols are great for displaying which sound we’re talking about if you can look at a chart, but since we only have audio here, we need to also have a common term for sounds. Now, as I said in the last episode, the long e is a sound that exists in many languages. When I say the sound (long e), the front of my tongue is high and very near to my tooth ridge. The tooth ridge is that bump right behind my top, front teeth. Take a second and use your tongue to feel your tooth ridge. Now that you know how the long e sound really feels, let’s look at it’s neighbor, the sound many of my students think is completely evil, short i—the sound. The short i sounds like (shots i) and is the vowel sound in the word “sit.” The short i does not exist in very many languages and so many non-native speakers simply use the more common long e sound in its place. To say the short i, the front of the tongue lowers just a tiny bit from the long e position. It sounds like (short i, sit). Listen to the long e sound followed by the short i (long e, short i). You know how I love minimal pairs, so let’s compare these sounds using some minimal pairs. I’ll leave time for you to repeat after me. To create the short e, the tongue drops just a little lower in the mouth than it did for the short i. Be careful, because even though it’s lower than short i, it isn’t nearly as low as the short a. Listen carefully to the short e sound (short e). Listen again (short e). I’m going to compare short i and short e. Listen to both. I’ll say the short i first, then the short e: (short i, short e, short i, short e). Now let’s compare all three of these sounds: I’ll say three words in the order of long e, short i, and then short e and I’ll leave time for you to repeat after me. Our textbook, Pronunciation Pages, which we can ship anywhere in the United States or can be downloaded anywhere in the world, has a lesson comparing these three sounds. That lesson also includes illustrations of the mouth, and adds a comparison with short u sound as well. And don’t forger, your purchase of Pronunciation Pages directly supports this podcast. So, if you’ve made a purchase or intend to in the future, thank you for your support. 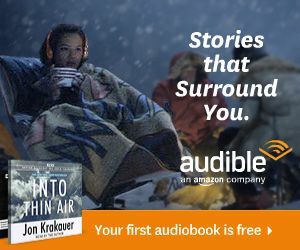 Help support this show by signing up for a free Audible.com trial! I love this because my students have great results when they practice their pronunciation by repeating sentences after native English speakers. With the newspaper audio, you get to hear audio that’s much less intimidating than the length of a book, you get to hear the rhythm and intonation of English, and you get exposure to fantastic vocabulary and grammatical structures. The link to use, if you want to support this podcast without actually having to pay for anything (because the one-month trial is free), is www.audibletrial.com/pronuncian. I’ll include that link in this episode’s transcript page and some other places on Pronuncian. To see this episode’s transcript, just go to pronuncian.com and click podcasts.